Rakesh Satyal's second novel is set in Cleveland, Ohio. It's a domestic drama of problems in Indian immigrant families. What makes the book distinctive is that the main characters are a gay single man and a married woman. Harit works in a men's clothing department and lives with his mother. She is old and confused, and is grieving over her dead daughter, so Harit dresses up as his sister to make his mother believe her daughter is still alive. Although the book opens with this, it does not dwell on the strange scene. Rather, we see Harit at work dealing with his overly-friendly colleague Teddy. Harit tries to be polite, but he isn't sure how to respond. As the novel develops, Harit moves from a position of isolation and misery to one where he creates a satisfying life for himself. Ranjana is married to a doctor and her son has just gone off to college. She is working out what to do with herself. She has joined a local group for aspiring writers, which puts her in touch with a completely new set of people, some of whom she likes. Satyal's descriptions of their meetings are especially funny and awkward. One night she ends up at a gay bar with a lot of gay Indian people, which is a new experience for her. She enjoys the change and starts to stretch herself as she makes new connections. But there is some tension between this exploration and maintaining her existing relationships which are based on tradition, and she has to negotiate that conflict. While Harit and Ranjana are the main characters, other chapters explore the history and experience of many other people they know, including their family, friends, and acquaintances. Sometimes a character we see rather peripherally comes into focus with a chapter of their own. 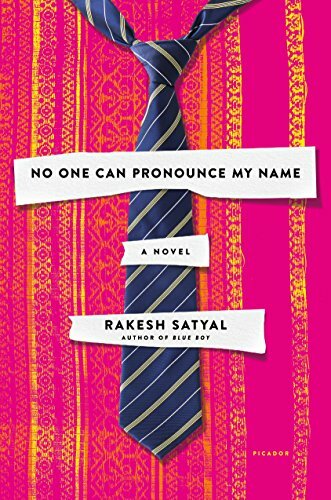 Taken together, No One Can Pronounce My Name presents the perspectives of a surprising range of people, mostly but not all of Indian origin. There's a lot of charm in seeing new immigrants adapt to their situation in America but also sustain their traditions, and this is a well-explored theme for literature. It's less common to see the variation within the immigrant culture and see how people are able to take advantage of freedoms in the new location. Satyal shows parts of life that most of us will be unfamiliar with, and his novel is especially engaging because of that. Satyal's writing is pleasing, with plenty of dialog and well-written prose. There's nothing pretentious about it. He also does not explain much of Indian culture or language, so when there are references to food or Indian tradition, readers will need to look up for themselves the terms referred to if they want a full explanation. This may pique the curiosity of readers, but they will still be able to understand the main plot even if they don't pursue this information for themselves.